It has stayed in the mid 50's today. I keep going outside and taking deep breaths of air. I've got little green shoots coming up all over and while there is still patches of snow, I have that wonderful sense that spring is on it's way. Out from storage came the Easter tree, now spring has to come! The bunnies are coming out of hibernation. Most of them have these wonderful ruffled collars. They want to dress their best for the season too! My collection of scripture plates looks so good with the bunnies. A constant reminder of the true reason for our Easter celebrations. 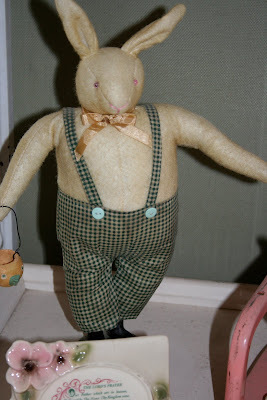 This dapperly dressed bunny is all set for a special get-together. A fun find on one of my thrifting excursions. 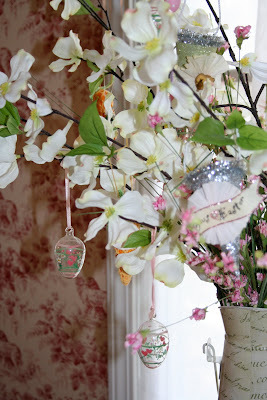 This pretty hat birdhouse hangs above a shelf in my entry way. I love dressing this shelf for all the different holidays and seasons. I enjoy it every time I pass by. A lone little bird taking a break from singing his song. I hope all of you are having a good Wednesday and enjoying the start of spring! Isn't it amazing how the Spring weather just lifts the spirits. I love to hear the birds singing. It just brings a feeling of hope and peace. Seeing your cute bunnies makes me want to go get out mine...soon...we just have to get the yard ready for our big egg hunt, then I can do the house. 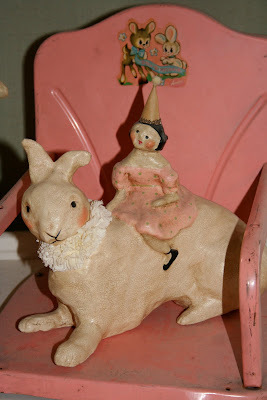 I love all you spring decor...So adorable!